» Engraved with P R N D 2 1. 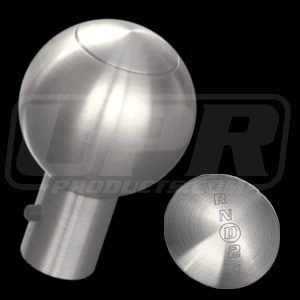 Innovative Bold Styling: Replace that Unsightly factory shift knob and move up to our Billet Aluminum Automatic Shift Knob. Quality Construction: Crafted to fit & function better than an OEM part, while giving you the bold clean styling of our aftermarket Dress Ups for your American Muscle Car. 1997-2004 Mustang owners will need to relocate the overdrive button with this handle. Click Here for Instructions Fits these Vehicles: 1987 1988 1989 1990 1991 1992 1993 1994 1995 1996 1997 1998 1999 2000 2001 2002 2003 2004 LX GT GTS Mustang Cobra Shelby Roush Saleen & Steeda Vehicles. Made in the USA!